A drunk driver who killed a conscript on leave has been sentenced to six years in jail. The sentence may seem lenient but is heavier than the benchmark one- to four-year jail term courts here normally pass in such cases. A Busan district court on Wednesday sentenced the driver for plowing into student Yoon Chang-ho and a friend on Sept. 25 last year as they were waiting at a signal crossing on Haeundae Beach in the southern city in the early morning. The driver, identified as Park (27), had drunk two bottles of vodka and four shots of tequila in a nearby bar. Yoon fell into a coma and died in hospital 46 days after the accident, while his friend sustained serious injuries. The driver had apparently been distracted by his girlfriend, who was riding shotgun when he crashed into the victims. Footage from the dash cam of the car showed he was incapable of driving normally. Judge Kim Dong-wook said, "We respect the punitive standards of the Supreme Court and must exercise caution in meting out sentences that diverge from them, but a tough sentence is necessary in view of the gravity of the offense and its tragic consequences." 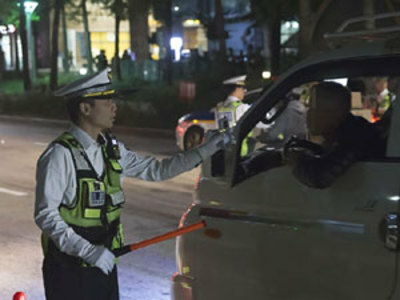 "The victim's family is calling for tough punishment, and there is widespread social consensus that drunk drivers must be dealt with firmly," he added. Yoon's family and friends protested that the sentence is too light and prosecutors vowed to appeal. Yoon had been a conscript in a scheme known as KATUSA whereby Korean soldiers are loaned as personnel to U.S. military bases here.